In his regular Go Figure column, Michael Blastland looks at how you map out a recession to get a fuller picture of how bad it is. How bad was the recession? I hear two things: "The worst since the Depression of the 1930s." And: "To tell the truth, not that bad." These don't add up. How do we reconcile "the worst for more than 70 years" with "ok, actually"? Maybe I'm hearing an odd sample of opinion. Maybe the truth is one or the other. Because there's no doubt the fall in GDP or national output was steep this time. But what this apparent contradiction might also suggest is that GDP - the official definition of recession uses only GDP - doesn't tell us all we want to know about how bad things have been. Then what does? If we add other indicators, which ones? And how do we put them together to give a fuller picture? Here's a stab at the problem - intended to raise questions rather than give a definitive answer. The answer is up to you. 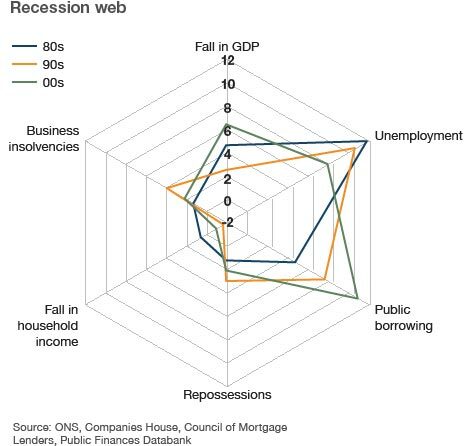 I call it the Recession Web - for obvious reasons. How it works (for figures see table at below): The tighter the line on the web, the less the pain. The wider or bigger the points of the line in each direction, the more the damage. As a rough means of eyeing up the differences, what do you think? Let's get all the obvious problems out of the way. This is a composite of indicators and all composites have flaws. One is how you weight each "bad". Are insolvencies as bad as unemployment? Is unemployment as bad as a fall in GDP? I've had to adjust the scale for one indicator - repossessions - to make it show up. And it's not always so easy to find so many consistent indicators across recessions going back decades. And what about the selection? Should we use the unemployment peak, or the size of the rise? Should we use the total fall in GDP, or the length of the recession, or both? Should the banks be in there in some way? And when do we pick our data points? I've taken the high point of unemployment during or following the recession, but in the 1980s this wasn't until a few years after the economy started growing again. Unemployment used to be called a lagging indicator. Some economists wonder if that's still true. But it leaves a problem of when we judge the effect of the recession to have ended. Should there be some softer, social indicators in there too, like a measure of anxiety? Every indicator has problems of its own, let alone when we stick them together. One advantage of the Recession Web is that if you think something is missing, just add it. Maybe this could be made interactive - so that you could slot in any of dozens of different indicators. All these questions are, I think, part of the fun. But it's also a serious business. How do we take a view in the round of economic pain? The Recession Web suggests one method that gives a quick visual sense of the variations, without massive complexity, and it does help pick out a few patterns. The recession in the noughties, for example, is bad on the big, macro indicators like GDP and public borrowing, but not so bad on micro indicators like the change in disposable household income. But the exercise makes another general point. What do we really care about when we say that times are hard? Indicators used: top to bottom percentage fall in GDP; peak repossessions as a proportion of mortgaged properties; peak quarterly unemployment rate; peak annual business liquidations as a proportion of companies on the active register; peak annual public sector borrowing as a proportion of GDP; worst annual change in real disposable income per head. We just need the pointy bit to go south now. If the cutbacks can be achieved, it could happen but I have my doubts as to whether they can pull it off politically before a crisis hits. It's Gordon brown shaped surely? This visualisation is obviously sensitive to the numbers on the various axis. Or is everything a percentage decline? What, slightly rippled with a flat underside? Just stating the obvious but the current shape apparently based on the last 10 years is a still a work in progress and over the next few years in due course could do a fair amount of shape shifting as the "recession" continues from the last years of the last decade well into the next decade and perhaps beyond. The other thing as referred to by an earlier poster is that the various axes seem out of scale. Perhaps the other 5 axes haven't moved relatively much over time and are contained inside that web diagram but true public sector borrowing including all the hidden figures should be right off the scale and even off the web (it would probably need another 3 or 4 webs) - but it's the ONS/CML etc of course. Then there's the hidden unemployed etc amounting to what say 8+ million so a bit of web stretching might help on that axis as well. The repossession stats are on a different market basis as well compared to earlier decades. The GDP is affected by the amount of borrowing so looks healthier in the noughties.